H.B. Fuller recognizes that the world’s finite resources create a need to minimize environmental impact, while creating value for its customers. We appreciate the need to preserve the natural water cycle. We understand that recycling is a smarter way to reduce the demand on virgin resources. We see that transforming the way we produce and use energy is a key factor for a sustainable future. As we help customers deliver the things that matter to people all over the world, we also connect our people with the resources to innovate and thrive. We are proud that the Lüneburg Adhesive Academy, H.B. 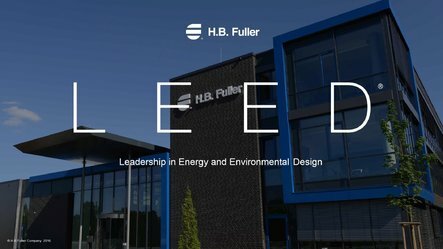 Fuller’s newest technical center of excellence, is LEED® certified to the Gold level. It was the first laboratory building in Germany in 2015 that achieved a Gold certification under version LEED v2009 NC (New Construction).